As Australian politicians fiddle with the details of an extremely insufficient climate change policy, I’ve been watching Arctic sea ice news with increasing dismay. Summer sea ice in the Arctic is fast melting away, accelerated by amplifying feedbacks in what has been called a “death spiral”. 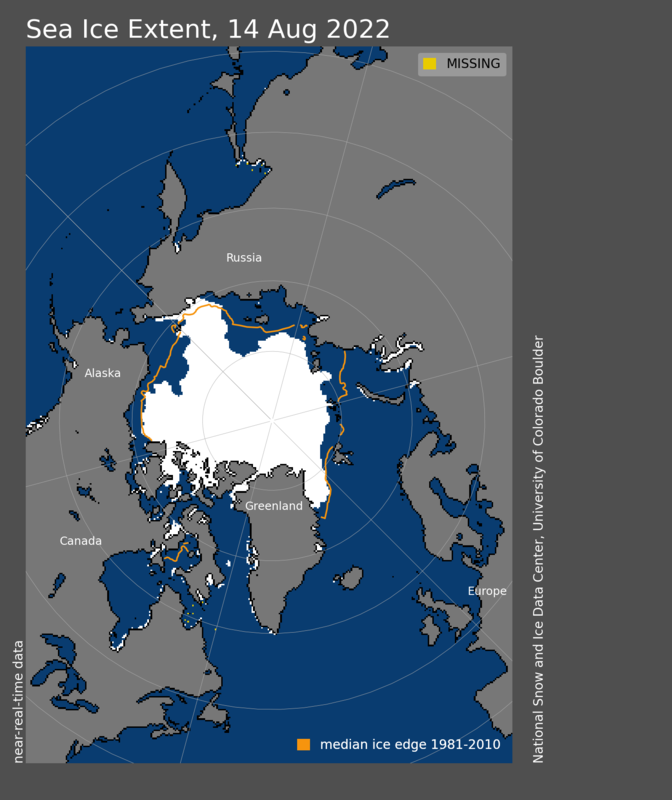 The disappearance of Arctic summer sea ice is a key tipping point. Sea ice floats on the ocean surface and is not to be confused with ice sheets on land. 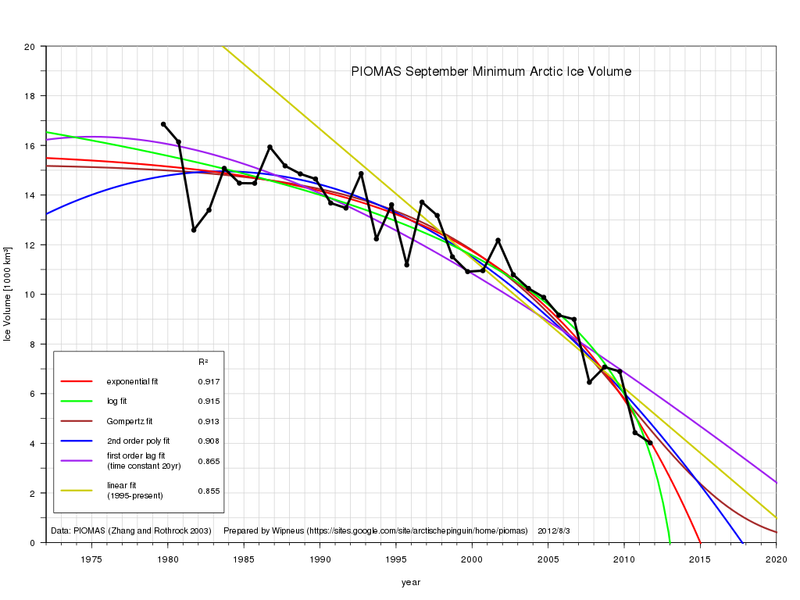 Arctic sea ice grows and shrinks seasonally, with an annual minimum in September. This year, eight independent datasets show we’ve already reached record low sea ice cover in the last week or so, with still weeks to go before the annual minimum. 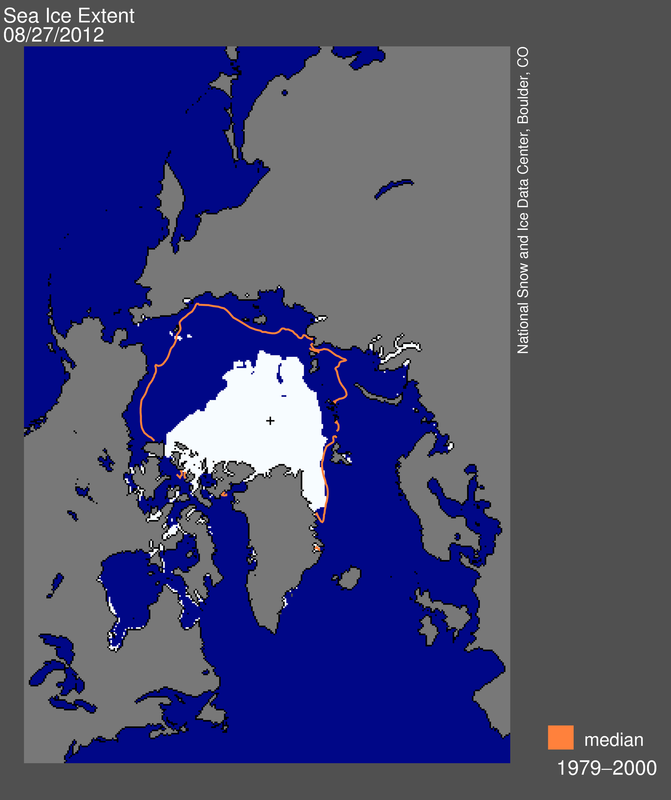 In the IJIS Arctic sea ice extent dataset (pictured above), the previous record was 4.3 million square km on 24 September 2007 (with the 2011 minimum not far behind). This year we’re only up to 29 August, yet extent has already plummeted to 3.9 million square km. As if that’s not astonishing enough, the ice continues to shrink by 100,000 square km per day. Normally at this time of year, melting slows down as the melt season draws to a close – but this time it seems to be still accelerating, which is unprecedented in decades of observations. Nobody can predict what will happen next. 2012 continues a long-term trend of accelerating melt. Satellites have been tracking Arctic sea ice extent with accuracy since 1978, and the six lowest years in the record are 2007 to 2012. The ice is declining in all months of the year, but fastest in summer when its role in keeping the region cool is most important. 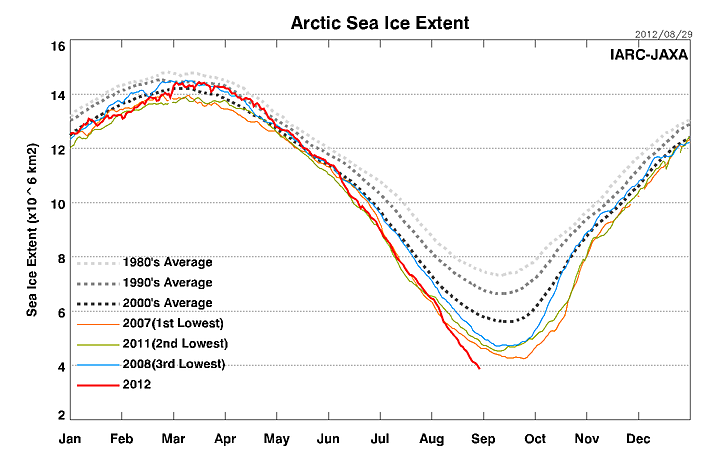 The ice extent that used to occur in September three decades ago now occurs in July. Previously nonexistent shipping routes are beginning to open up. The blue line shows model projections of Arctic sea ice minimum extent from the last IPCC report, published in 2007 (the shaded area is the distribution of model runs and the solid line is the average of all simulations). The red line is new projections to be included in the next IPCC report to be published in 2014. 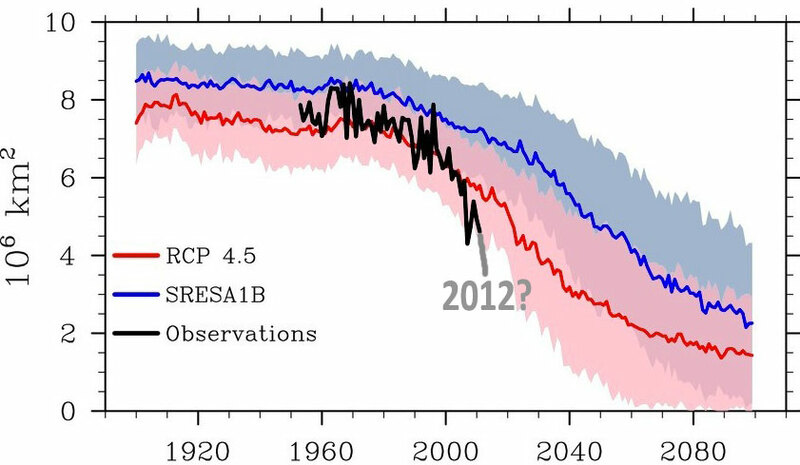 The black line is real-world observations, with a speculative value for 2012 shown in grey (it assumes another 350,000 square km is lost, which would only take a few days at the current melt rate). This graph is a stark demonstration of how out-of-date and conservative, IPCC reports can be: the ice is already melting faster in the real world than in projections that will not be communicated to politicians until 2014. Whereas extent in 2011 was about a third below the 1979-2000 average, according to PIOMAS volume in 2011 was about two-thirds below the 1979-2011 average. 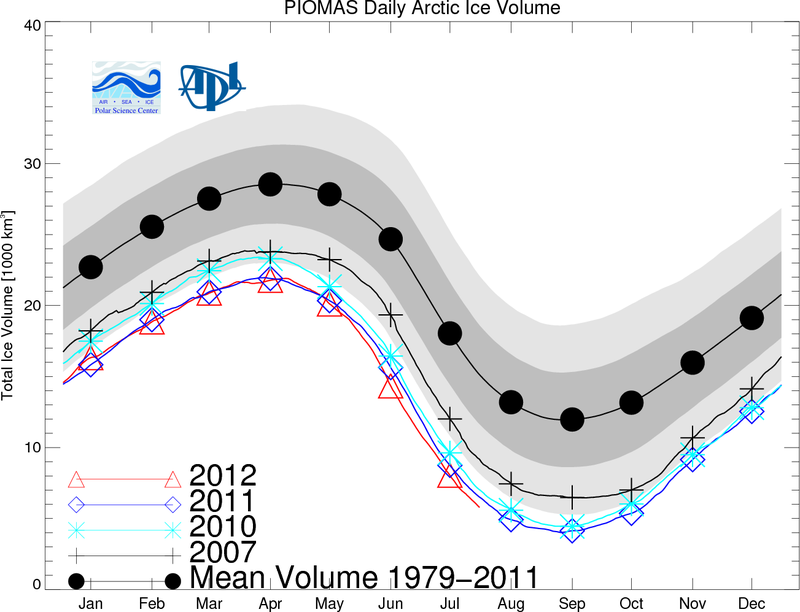 And while extent data fluctuates from summer to summer (leading contrarians to claim Arctic sea ice had recovered since 2007), PIOMAS volume data clearly shows an unceasing death spiral. 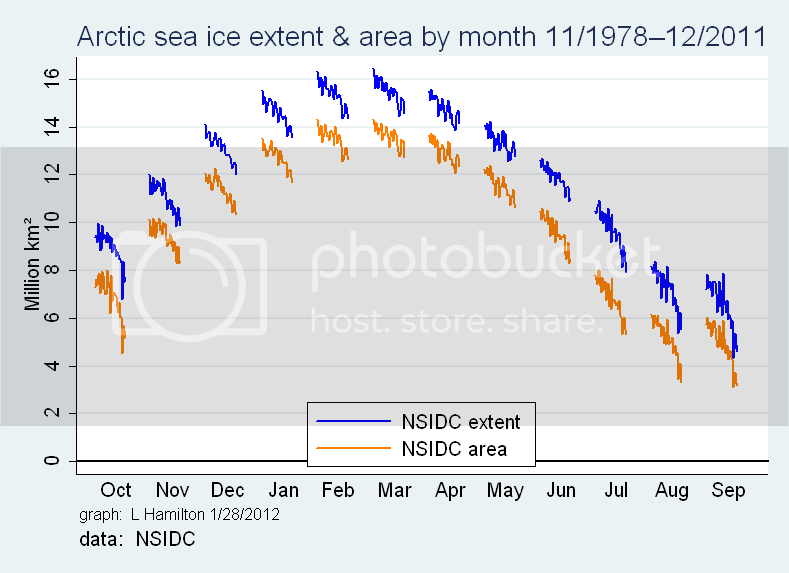 The data has not been updated since 31 July 2012, but on that date there was 10% less ice than on the same day in 2011. A recent study concluded that 70-95% of Arctic sea ice loss is caused by anthropogenic global warming (attributing the other 5-30% to the natural Atlantic Multi-decadal Oscillation). The Arctic is the fastest-warming place on Earth, with temperatures rising up to 4 times faster than the global average. Indeed it is warming so fast, NASA recently had to add a new color to its temperature maps to depict Arctic temperatures. I have compared global warming to the sinking of the Titanic. The ocean liner was so gargantuan and stably designed it took hours to sink. Passengers did not believe the ship would sink, as it showed few outward signs of being in imminent danger, yet in the boiler rooms more compartments were flooding than the ship could withstand. Similarly, the Earth’s climate is an enormous beast that is deceptively stable and slow to respond to disturbances. The Arctic is the Earth’s boiler room. Losing Arctic sea ice would not be just bad news for polar bears. Its decline means we are moving out of the benevolent range of global climates that have existed throughout the history of human civilization. The dramatic drop in surface reflectivity would accelerate regional warming, which could in turn trigger more serious tipping points such as collapse of the Greenland ice sheet (which is already losing ice at an accelerating rate), and/or large-scale release of carbon from permafrost and/or methane hydrates. In the shorter term, the change in Arctic temperature may already be disrupting the jet stream, increasing extreme weather (including extreme cold) in northern mid-latitudes, and could also disrupt deep ocean circulation. And there’s another potential feedback depending on human stupidity (which does not appear to be in short supply): the melt is opening up the Arctic Ocean for oil and gas exploration, and fossil fuel companies are licking their lips. The Arctic meltdown is the latest in a series of astounding record-breaking weather events that have occurred around the globe in the past two-and-a-half years (eg. ongoing drought devastating crops in the US). Yet many will not even hear about it. It is long past time for journalists to spend fewer resources covering advertisements featuring Miranda Kerr and far more covering the unfolding story of the century: climate change. Given the potential to set off a chain reaction of tipping points affecting all of humanity and life on Earth, the Arctic sea ice death spiral should be a wake-up call to urgently decarbonize our global economy before climate change spirals out of our control. Will we heed the warning from the boiler room?